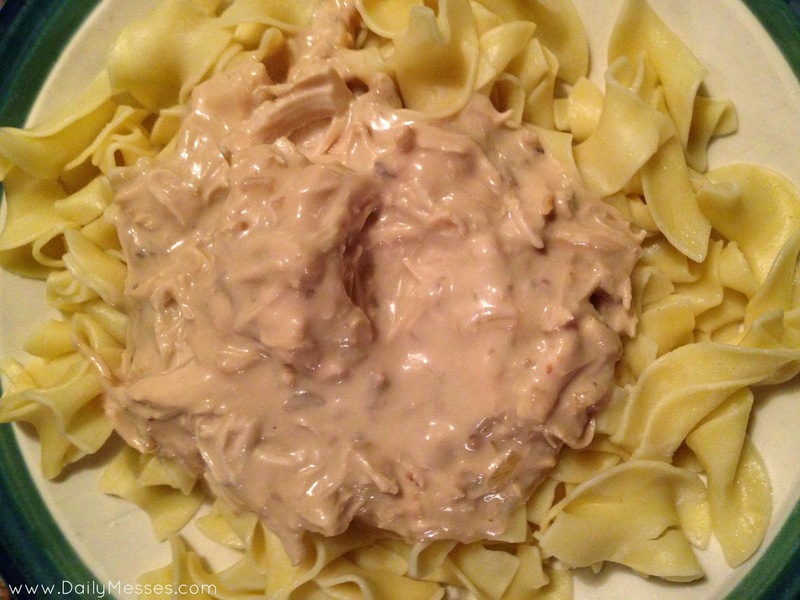 I love beef stroganoff, so when I came across a chicken version of the recipe, I had to try it! It doesn't make a pretty picture, but it tastes wonderful! 1. Lightly spray the inside of the crock pot. 2. Place chicken breast on the bottom of the crock pot. 3. In a small bowl, mix together the onion soup mix, cream of mushroom soup, and sour cream. 4. Pour mixture over the chicken. 5. Cover and cook on Low for 7 hours*. DM Tip: I will stir the creamy mixture about 2 times during the cooking process. I don't think you need to, but it does help keep the mixture from sticking/burning on the sides of the crock pot. 6. Shred the chicken and stir in the sauce. DM Tip: I shred it in the crock pot using two forks. 7. Cook Egg Noodles according to package directions. Drain. 8. Serve chicken stroganoff over the noodles and enjoy! *Crock pots can run hotter than others, so the time could be less. You want the chicken to be cooked and super tender. It should shred with a fork easily.